Schneit es monentan in Fiss ?Vielen Dank! Fiss is in the middle of three interconnected villages in the western part of the Tyrol. The others are Serfaus and Ladis. The region has 160 kilometers of prepared slopes and 38 lifts. Fiss has 19 lifts and a terrain park. There is at least 60 kms of cross country skiing at Fiss. 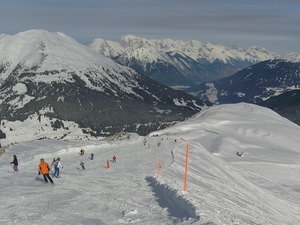 Just returned from a week winter holidays in Serfaus-Fiss-Ladis (March 2012), was really impressed by this resort. The skiing area and the facilities make this resort one of my favourite. I usually spend more time off piste than on the pistes, both on skis and snowboard, often find the regular runs not challenging enough, I found in Serfaus and Fiss some steep pistes making it a great skiing area! Besides that, we were very lucky with the weather, and had 4 days of fresh snow, which made off-piste simply amazing. A good thing in this resort is that the off-piste skiing area feels relatively "safe", in the sense that there aren't cliffs or huge rocky areas close to the pistes, but of course the avalanche risk remains high, reminder given by the numereous avalanches (artificially or naturally started) surrounding the pistes. For fan of apres-ski, this is probably not the most animated place, but bars could bring some good fun after a great skiing day. There are lot of activities for kids, that's true, but the exceptional skiing area makes this resort a very good tip, not only for family. As the pistes in this resort are very well exposed, the snow in the lower runs in the afternoon can be a bit heavy / wet. Lesen Sie 2 andere Beurteilungen ueber Fiss oder geben Sie Ihre eigene Bewertung ab.